Description: Early bird's-eye view of the city. Coloured. Description: Naples. Glorious decorative map of Naples and the surrounding area. with a key to the landmarks. Original Colour. 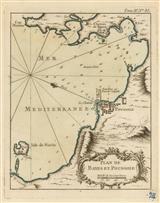 Description: Sea Chart of the Gulf of Naples. Marked with navigational notes. 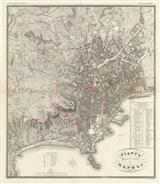 Description: French port atlas map of Pozzuoli, Naples. Original hand colour. Description: Attractive copper-engraved map of the Bay of Naples, with numbered key to landmarks and churches. Strong impression. Description: Naples. Large city plan. Original colour. Description: Naples. City plan and environs. Inset vignette of Bay of Naples and Vesuvius. Coloured. 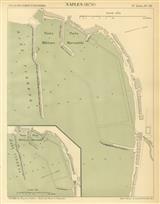 Description: Plan of the port of Naples showing the projected construction of new piers and facilities. Printed colour. Description: City plan of Naples with printed colour and two large vignettes of the city on the lower border. Description: Naples city plan with guide to the Railways. Inset vignette of Vesuvius. Coloured. 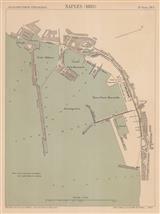 Description: Plan of the port of Naples showing newly reclaimed land as well as newly built piers and facilities. Printed colour. Description: Detailed German language map of Naples. Printed Colour. Description: Phlegraean Fields near Naples, with insets of Capri and the Campanian coast. Printed colour. Description: Naples. Detailed plan. Original printed colour. Description: Detailed city plan of Naples showing train lines, major roads, and important buildings. Printed colour.